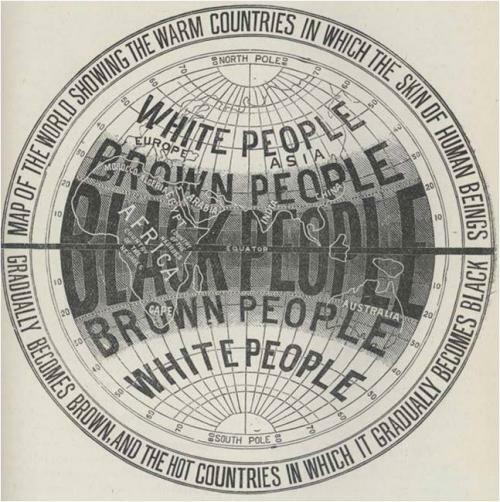 Map of the world showing the warm countries in which the skin of human beings gradually becomes brown, and the hot countries in which it gradually becomes black, 1903. E.W. Cole, The White Australia Question, Melbourne, E.W. Cole Book Arcade, 1903. A 1903 map by Melbourne bookseller, E.W. Cole, illustrating the idea that each of the major racial groups had its proper place on the planet; movement between zones would cause change of skin colour. Cole’s original caption stated that ‘Australia lies in the tropics and semi-tropics, and, consequently, all her people must become more or less coloured. Therefore, a permanent White Australia is a physical impossibility’.